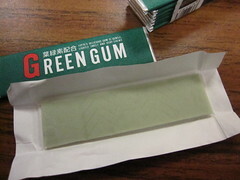 Another item in my package from Tsunami.hk was this Green Gum. With only that name to go on, I assumed it would be mint, but it was hard to be sure. The simple, old fashioned, and, of course, green packaging didn't give much away. Green Gum is one of Lotte's signature gum flavors, and according to their Let's Chewing website, it contains chlorophyll and green tea flavonoids, giving the chewer minty and woodsy sensations. The gum gave me deja vu; it smelled just like the candy cane page in a Christmas scratch and sniff book I had as a child. The mint flavor different, but it was fresh and a little sweet; it reminded me most of spearmint. There was a hint of evergreen, making for a woodsy, refreshing mint flavor. The texture was soft and bouncy at first, and the cooling effect was pleasant. I loved it at first, but within 2 or 3 minutes, it lost most of its flavor, then became firmer as I chewed. Still, the initial flavor was unique and tasty and it was a good breath freshener, but it wasn't a long lasting chewing gum. I love the package design on these. And why have I never had gum with chlorophyll? The design is rather classy! I think this gum is pretty easy to find in Asian grocery stores, if there is one near you. I really loved the flavor, but I just crave a longer lasting chew. Maybe that's just because I usually like to chew the same piece of gum for half an hour. this my all time favorite gum. i can chew it for hours and hours..